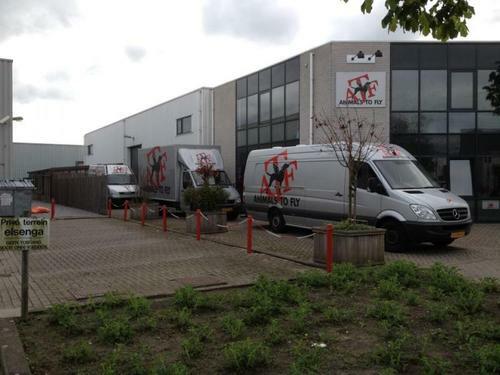 In order to make sure that you have your birds imported by Kuhn Family Loft, you must make arrangements with us immediately after purchasing bird(s) from Europe, so that we may let our exclusive quarantine station know that you are working with us, and make arrangements to have birds in next shipment. Your pigeons come to Minnesota, which has a cool temperature for nearly the entire year. Be careful of other importers, who deal with extreme heat and provide lower end shipping & quarantine standards. Next collection will take place Dec 1st Previous collection was end of October. Let me know if you need a pick-up. Pigeons have been arriving in beautiful condition. Sometimes we collect twice in busier months. Importing both racing and some fancy breeds of pigeons has never been easier. We handle everything during each step of the process. We are the only importer that uses a very high-end exclusive quarantine. Only the best for your pigeons. All sexes are separated and "like" breeds are kept together. Do not try to save $5-$10 and have your pigeon go missing for months or arrive in terrible conditions, or even worse arrive deceased. No importer can compare to Kuhn Family Lofts. We import from the famous, and lessor known fanciers. - We will have your pigeon(s) for importing picked up at the breeder's loft, and delivered to Dutch Quarantine & Veterinary Facilities (ATF). -We will ship your pigeon(s) at a discounted online USPS rate. We charge less than the actual postage compared to if you had to walked in to a post office to ship. -We always ship birds in "NEW" express mail shipping boxes. -We never add on extra for handling, post office shipping or shipping boxes, like others may do. Don't be tricked by all hidden cost other importers may tack on. Keep in mind that small items like medication can be shipped along with birds at NO extra shipping cost, providing there is room in the box. -We import from the United Kingdon and many other European countries. -Every shipment that arrives at Kuhn Family Loft is wormed, bathed, and given every possible grain & mineral. No one can beat our importing prices or service! $185 per pigeon from Belgium & Holland to the USA. Some aditional charges from other countries/shipping/veterinary certificate of health may apply. 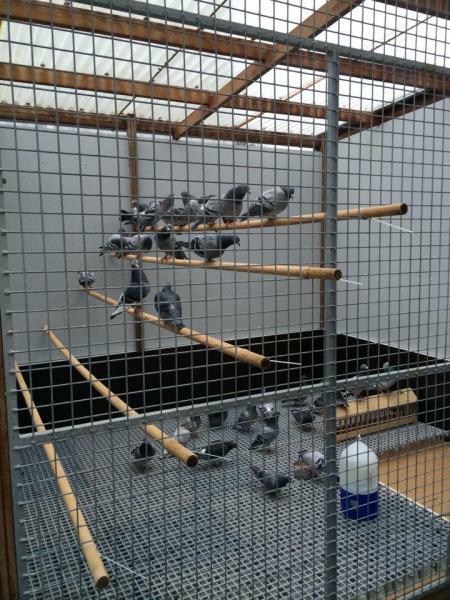 The pigeons are cared for under veterinary supervision by one of the top pigeon veterinarians in the sport. The pigeons are kept in multiple quarantine rooms, with each being controlled with high tech ventilation. Strict bio-security protocols are in place that go above and beyond what is required by government. You'll probably never see pictures of our competiotor's quarantine stations. The owner and staff of Animals to Fly (ATF), and Dutch Quarantine & Veterinary Services are #1 in Europe in piegon care and exporting. 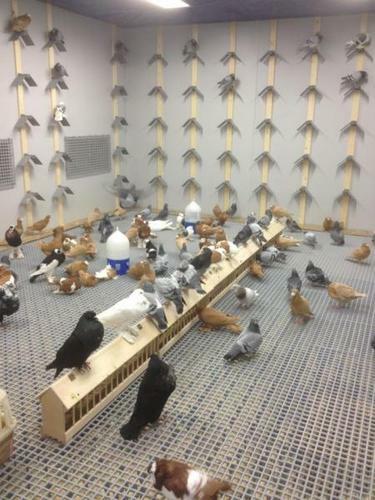 Kuhn Family Lofts will only do what is best for your pigeons while in our care. We are experts in every aspect of pigeon care, and importing. 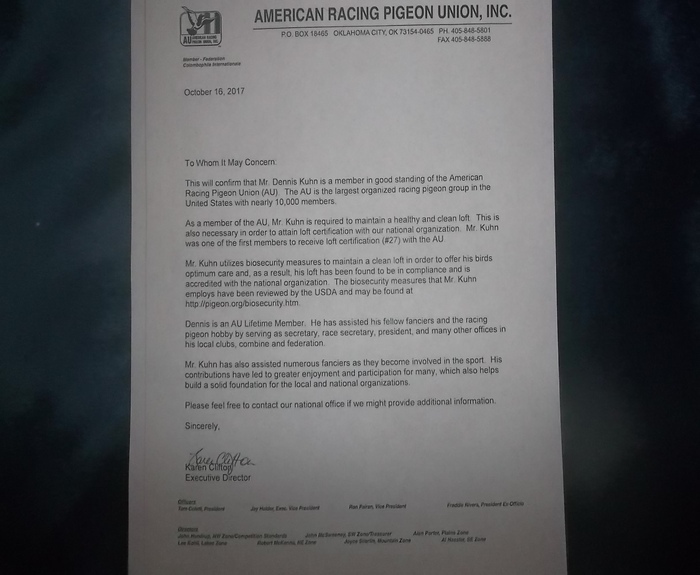 Dennis Kuhn Lofts has 35 plus years in the sport, is a lifetime member of the American Racing Pigeon Union (AU), member of the NPA, current president of the Heartland Federation, publicity director of the Minnesota State Pigeon Association (MSPA), and very well respected amongst his peers in the pigeon hobby. We are honest , reliable, and treat all imports as if they were our own pigeons. We may not be the biggest importer of pigeons in the USA at this time, but definately are one of the BEST!! !